We’ve all heard that chocolate milk is good for recovery. But what about for fuel? And what if it’s not milk at all? It really does taste like chocolate milk. Cornstarch is a pretty amazing ingredient. It takes very little liquid to dissolve so you can pack an entire marathon’s worth of calories in a single 8-ounce bottle! You will still need to stop at the water stations to get enough hydration, but I’m really happy that I can get away with a single small bottle of fuel and say goodbye to gels forever. I’m not always in the mood for a citrusy drink and thought that chocolate would be a great addition to my flavor choices. A little cocoa powder does the trick! If you make this recipe, experiment with the amount of liquid you add. I like that I can add very little water so I don’t have to carry so much weight, but you might prefer your fuel on the thinner side. You absolutely must sweeten this and I prefer NuNaturals Pure Liquid Vanilla Stevia. About 10 drops provides the sweetness of 2 teaspoons of sugar. I have not tried powdered or granular stevia in this recipe because I’ve never found anything I’ve liked, but I might try some out to keep the ingredients all dry. (Better for traveling!) If you try a dry sweetener, let me know how it goes! For variation, I’ve also added a teaspoon of PB Fit peanut butter powder to make PB Chocolate Milk. Yum! A sugar-free liquid fuel that is an alternative to gels or chews. 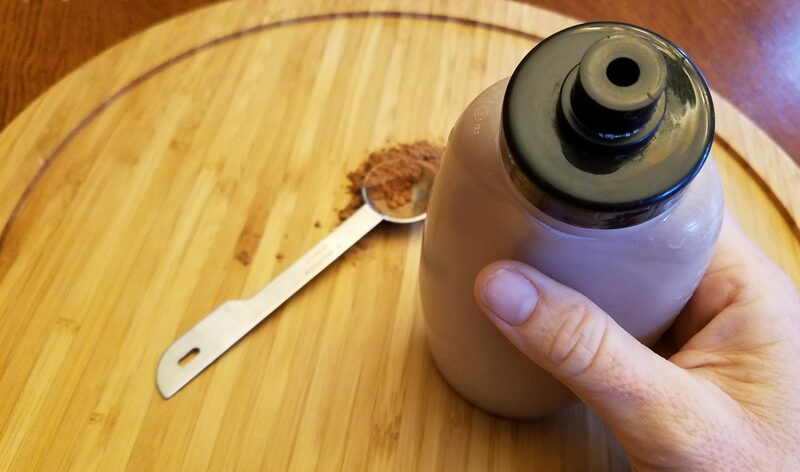 Recipe can be doubled to fill an 8-ounce water bottle for over 300 calories of fuel in one small bottle! The ingredients will settle to the bottom fairly quickly, so shake before drinking. Mix all ingredients except water together in a small measuring cup with a spout. Slowly add enough water to your desired thickness. Two ounces will be like a runny milkshake and four ounces will be like thin chocolate milk. Stir thoroughly and pour into a small running water bottle. No being a vegan, your recipes always intrigue me. My bro was a vegan for a couple of years (he's full veggie though) and I was a veggie for a couple of years but swung back to meat though I try to keep it to eggs and fish mostly....(doesn't always work as my waistline proves). Anyways - one of these years I'm will put off the kids chaos that's life now and try one of these recipes. Keep 'em coming! Claire, I've just returned from my Sunday LSR, and I wanted to let you know how impressed I am with this recipe! I used about a tsp of molasses instead of Stevia (didn't have any). I can't wait to try it again next week - I'll take it about an hour before stepping off next time vs 30 min. Cheers! I'm so glad it worked for you, Karen! I really love it and it's so much better than gels, for convenience, taste, and price. Thanks for commenting. I've been experimenting with the sweetener as I don't really like the taste of stevia. I tried a little bit (maybe 1/4 tsp) of coconut palm flower sugar and that worked well for me. Great recipe Claire, thank you for sharing! That's awesome, Jo. I don't usually like stevia either, but the liquid NuNaturals brand is really good. I order it on Amazon. I think a little sugar (maybe even corn syrup?) is a great idea since you don't need much at all. Glad you are experimenting! I am using now gels in my long run every 40 min. what is your recommendation for a marathon run? If I run about 4.5 hrs, how much of this race fuel liquid should I take? It is very important to practice and see what works for you. My suggestion to to take 40-60 grams of cornstarch (mixed with the salts and whatever flavor you like) about 45-60 minutes BEFORE the race. This will fuel you for at least an hour of the race, more if you are running slower and less if your body weighs more and therefore burns more calories. At around the 60 minute point, you can start sipping on fuel. If you read my Charleston race report, I talk about exactly how I did it, using a 60g solution during the race. You might need 80-100g. The good thing is that cornstarch does not need much liquid at all to dissolve, so you don't need to load yourself down with bottles. You could practice with 2 8-ounce bottles with 60g in each and see how that goes. One thing that happened during practice to me is that when I made the concentration around 90g in 8-ounces that my bottle top clogged. The liquid was not super thick (sort of like a melted milkshake), but a clogged bottle would be a disaster in a race. Experiment and write back letting me know how it goes! Hi Brian! My website was hacked and all the recipes have disappeared! Working on a fix. 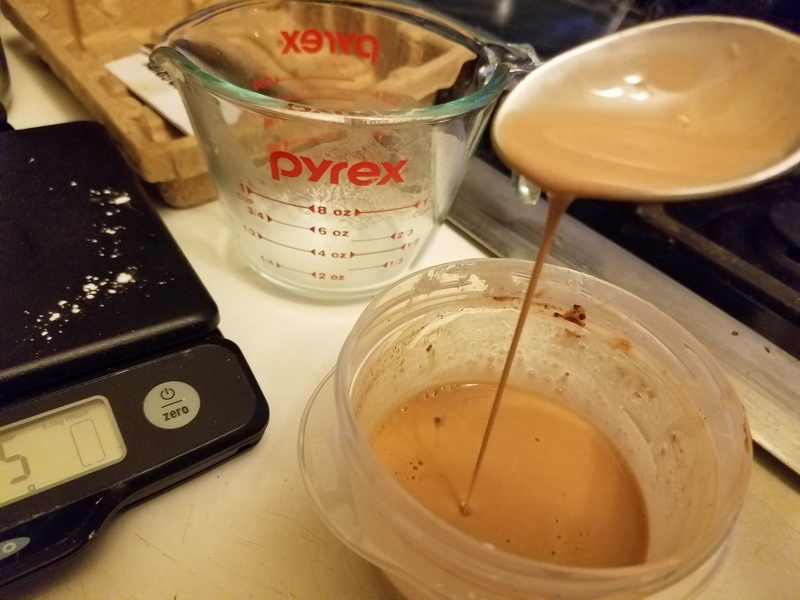 The chocolate recipe is 40g (about 1/4 cup) cornstarch, 2g cocoa powder (about a teaspoon), 1/16 teaspoon salt, 1/16 teaspoon Morton’s Lite Salt, 10 drops of vanilla stevia liquid, 2-4 ounces of water, depending on preferred thickness. Mix all ingredients except water in a small measuring cup with a spout. Slowly add water to your desired thickness and pour into a small bottles. Makes 1 serving. Each contains 153 calories, 38g carbohydrate, 219mg sodium, 87mg potassium, plus small amounts of calcium and magnesium. I am confused, doesnt cornstarch have a very high glycemic index? isn't that the whole reason they made UCAN? because it digests so much slower and improves endurance by keeping insulin down and allowing higher fat oxidation rates? 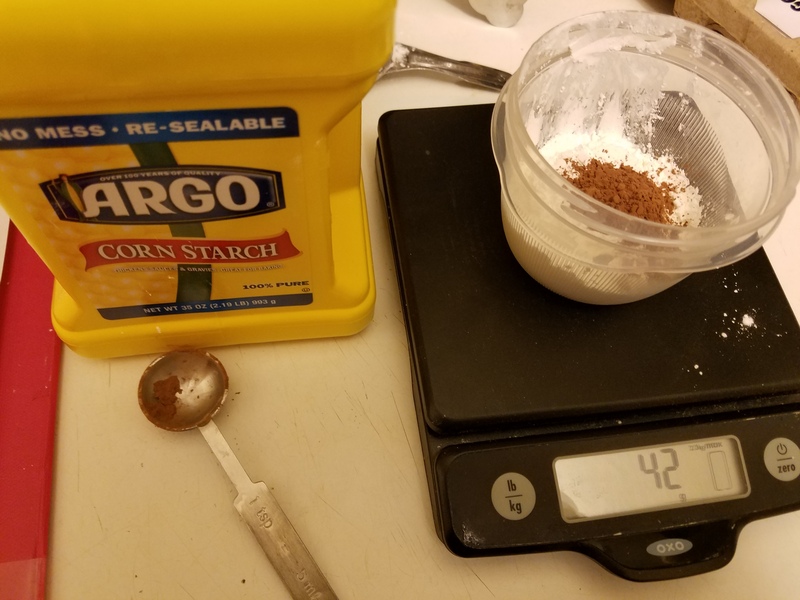 Does regular cornstarch have the same effect? Cooked cornstarch does have a high glycemic index. Raw cornstarch is very different. Great to hear, Scott! I actually prefer tapioca powder as well. Let me know how the other experiments go! Hello! So do you just take this before your long run and then again after an hour of running? say For example on a 3 hour training run. Thanks! Hi Tommi! I take some before and then bring a bottle with me for fuel. For recovery, I prefer real food! Claire, This is awesome! I will definitely try both your UCAN recipes...have you tried it with any protein powder? Thanks, Tommy! I've mixed in some PB Fit peanut powder for protein and that's really good! Thanks Claire! Love the page and info.